This evening 5 yrs ago at 9:22pt our precious mom-mom, the forever beautiful & glamorous Momma Ann rose up to her heavenly place. This was so clear as I held her and held onto every moment, watching her elevating and looking up as she took her last breath, with a peaceful smile on her face. I was so blessed to have a mother who adored me and truly loved her granddaughter @tiffanytrump more than anything. She was so beautiful as you can see in this photo when she was homecoming queen and so sporty & playful as here with Tiffany when she was in her mid 50’s. 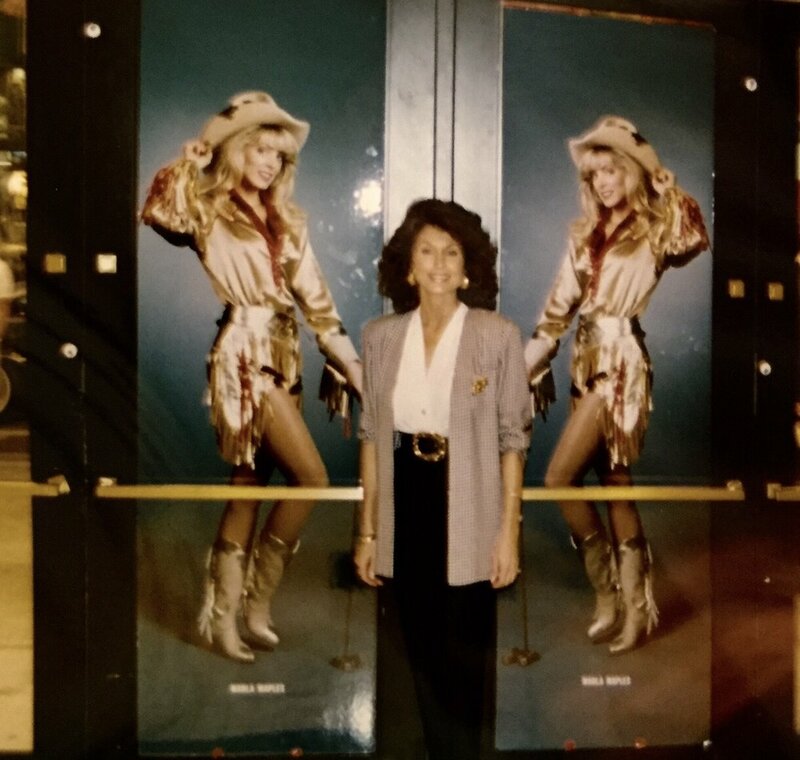 Mom always supported me so proudly, here posing outside the Palace Theater when I was performing on #Broadway after probably watching her 100th performance. And she was the best dancer of all! Mom gave her heart and soul to her family and today I can feel her loving and yes still feisty spirit with me. Mom with me in the background as Ziegfeld’s Favorite in the Will Rogers Follies. The eve of New Year’s Eve is upon us & tonight I want to share how I’m using this gift of time to bring forth dreams I hold deep in my spirit. I was inspired this morning by the pastor of a church I was visiting who shared the importance of writing our visions then handing them over to God. I told him that God blesses me with so much creativity ... thoughts, ideas, visions, but it’s the lack of completion of many of them which nags at my heart daily. I see them clearly but then self-doubt comes. How can I? How do I? Am I equipped for these dreams? So before the birth of 2019 I’m asking confirmation that my dreams are intertwined with God’s dream and then I will put one foot and then the other forward, holding the vision as I place it in the hands of God. I ask that my footsteps will be guided by the Light. God inspires the dream... let’s us bring Honor to the dream. Scenic drive in the beautiful mountains of India! Do you think I’m a little excited in this video? 😂 An afternoon driving higher and higher into the Mountains of Abu had me reminiscing over the beautiful North Carolina mountains I know so well, when all of the sudden I was reminded that we are on an adventure in a new land! 🐒 🐒🐒 I love the mysteries of this place! Enjoying discovering a new place in the world... feeling the peace and gratitude. Romania has some of the kindest people, the ladies have the most beautiful skin, and the food is so fresh plus we can always find healthy vegan options. Sending peace from my heart to yours today, from Herastrau Lake. Last day in London with Tiffany under the gaze of the most blue skies and guarded by the bronze Lions of #TrifalgarSquare So perfect as we step into the sun energy of Leo – Infinite Light, offering countless possibilities to do good and plant seeds for change. This is the time to take proactive steps toward realizing your deepest desires. So with gratitude I thank England 🏴󠁧󠁢󠁥󠁮󠁧󠁿 and all our friends there for memorable times surrounded by love. Ps Tiffany & I didn’t plan the Blue Pinstripes but I love it! Always expect the gift of Angels 🕊 ...Even in unexpected places… all we have to do is open our eyes to see, our ears to hear, our senses to feel... I woke late this morning after a beautiful wedding celebration at The Observatory at Freedom Tower last night. I rushed to my favorite community church where a dear friend decided to surprise me and join. Afterwards, our walk & conversation led us to a neighborhood coffee shop where the barista presented me with the warmest smile and this angelic latte. I smiled back and told him you’ve just reassured me that angels are always with us… was your intention to create this? I was just doodling for you… he answered 🙂. What gifts will you find today? My good friend Tara Sutphen and I recently shared radio time where we talk about friendship, who we are, and the ways in which we find joy in life. We focus on healthy eating, my funny little journey with wheatgrass and the power to stay young through food and holistic alternatives rather than choosing more intrusive options. We talk about the importance of staying close to nature to keep your mind stress-free. Click here to listen to other ways to keep living a healthy, loving life on Contact Talk Radio Network. I had a wonderful interview with Sister Jenna about the power of our voice and my journey into the awakening. From growing up in a little town in Georgia towards expanding my mind and soul in New York and California. It's a little insight into who I am and why I'm doing what I do, with so much love and dedication. I have attached the link here for you to check it out and the first 10 minutes are a wonderful meditation conducted by her. So when I had the opportunity to share a dinner with he and his lovely wife Ruth in the ‘90’s, my reaction upon meeting him should not of surprised me, but it did. It felt as if I was in the presence of Moses himself, as the warmest tears began to flow down my face. They weren’t tears of crying… but tears of being in the face of Grace. My soul was so warmed and I was filled with joy. How interesting it is that he left this world on Feb 21st, with the death anniversary of Moses being Feb 22. I have to believe this is no accident as now this man of such humility and non-judgment is sitting in his heavenly place to help bring more unity and understanding into our world.